Recent visits to Jamaica Bay, in addition to providing a wealth of bird sightings, have allowed me to see some Gray Tree Frogs (Hyla versicolor) up close and personal. They are particularly likely to be found hiding in cracks and crevices in the bird blind at Big John’s Pond, a fact I read quite some time ago in a post by The City Birder. So now every time I make my way over to the blind to look for Barn Owls I take a moment or two to see if the frogs are present and visible. Gray Tree Frogs, according to Wikipedia, are also known as North American common tree frogs, and can change color from their namesake gray to a light green, but much more slowly than a chameleon. The underside of the frogs’ legs is a bright orange-yellow, but one can typically only observe this coloring if one has a frog in hand or manages to get a good look at one jumping. They are widespread over the United States and Canada, and can be found almost everywhere in New York State. Apparently, they also make easy-to-care-for pets, though we here at 10,000 Birds actively discourage people removing creatures from the wild, no matter how cute they may be. So the next time you are at Jamaica Bay, or, for that matter, any wet, forested area in North America, keep an eye out for these easy-to-hear-but-usually-difficult-to-see frogs. You won’t regret it! Ha! That’s ridiculous. Never heard that one before. These are great frogs (my favorite NY species). I should post a few of my own pictures. Gray Tree frogs are my All time favorite frogs! My alarm in the morning is of the Gray Tree Frog calling! Nick, only known them as Gray Tree Frog! i found one of these guys in hampden, yesterday on the garage door. it sat on my hand and didn’t seem to be in a hurry to go anywhere. I finally convinced him to jump off onto the rock wall. He must eat well, he was full-figured compared to some of the pics i’ve seen. Spring/Summer 2008 must be year of the grey tree frog here in Pennsylvania, because I came across some 15 frogs this evening. I captured most of them on the roadways surrounding my community and released them back into a wildlife reserve a mile or two from my home. I returned home only to find 4 more grey tree frogs hanging around the front porch light awaiting dinner (moths). In the past several years these frogs were no where to be found. I find it quite perplexing as to why so many have been found around our home this year. I’m guessing a wet Spring brought about a lot of mating, and this is the reason I’m spotting so many. Lovely little creatures to observe and study. I live in Indiada and I have always loved frogs. Tree frogs are my very favorite. I tried to find my newly found pets on the internet and they call them Grey Tree Frogs. My frogs are green most of the time. I have one that is almost all green with no bark looking marks at all. I’m trying to rescue them. There are less and less of them every year so I catch as many as I can while they are little and take care of them then I lit them go where I know they will be a lot safer then where I found them. Sometimes I keep them over winter to ensure they will be big and strong to make it outside alone. @Kellie: While I’m sure your motives are pure please, unless you are finding them in the middle of the road, just let the frogs be. While you may think that you are helping them, removing them from the wild is not helping. Remember, these frogs have managed to survive as a species for millions of years without help. The Cope’s Grey Tree Frog (Hyla chrysoscelis) is a species of tree frog which is found in the United States. It is almost indistinguishable from the Grey Tree Frog, Hyla versicolor, and shares much of its geographic range. Both species are variable in color, mottled gray to gray-green, resembling the bark of trees. These are tree frogs of woodland habitats, though they will sometimes travel into more open areas to reach a breeding pond. The only readily noticeable difference between the two species is the call–Cope’s has a faster paced, and slightly higher pitched, call than H. versicolor. In addition, H. chrysoscelis is reported to be more slightly smaller, more aboreal, and more tolerant of dry conditions than H. versicolor (Martof et al., 1980). The range of H. chrysoscelis is more southerly–it is apparently the species found in the lower elevation Piedmont and Coastal Plain of Virginia and the Carolinas. In those areas, H. versicolor may be present only in the Appalachians (Martof et al. 1980). 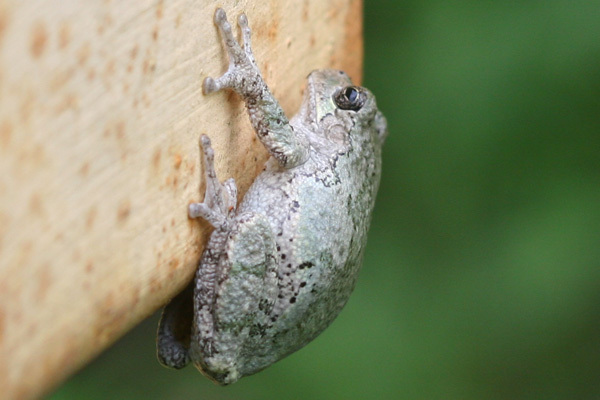 The Bird-voiced Tree Frog, Hyla avivoca, is similar to Hyla chrysoscelis/versicolor, but is smaller (25-50 mm length, vs. 32-62 mm for the Grey Tree Frogs). Both species are variable in color, mottled gray to gray-green, resembling the bark of trees. These are tree frogs of woodland habitats, though they will sometimes travel into more open areas to reach a breeding pond. The only readily noticeable difference between the two species is the call–Cope’s has a faster paced, and slightly higher pitched, call than H. versicolor. In addition, H. chrysoscelis is reported to be more slightly smaller, more aboreal, and more tolerant of dry conditions than H. versicolor (Martof et al., 1980). The range of H. chrysoscelis is more southerly–it is apparently the species found in the lower elevation Piedmont and Coastal Plain of Virginia and the Carolinas. In those areas, H. versicolor may be present only in the Appalachians (Martof et al. 1980). The Bird-voiced Tree Frog, Hyla The Gray Tree Frog (Hyla versicolor), written more commonly as one word as Gray Treefrog, is a species of small arboreal frog native to much of the eastern United States and southeastern Canada. It is sometimes referred to as the Eastern Gray Treefrog or Common Gray Treefrog or Tetraploid Gray Treefrog in order to distinguish it from its more southern genetically disparate cousin, the Cope’s Gray Treefrog, Hyla chrysoscelis. It may sometimes be referred to as the North American Tree Frog by Europeans in order to distinguish it from their European Tree Frog, Hyla arborea. As the species name Hyla versicolor implies, gray tree frogs are highly variable in color owing to their ability to camouflage themselves from gray to green, depending on the substrate they are sitting on. The degree of mottling varies. They can change from nearly black to nearly white. They change colors more slowly than a chameleon. Dead gray tree frogs and ones in unnatural surroundings are predominantly gray in color. They are relatively small compared to other North American frog species, typically attaining no more than 1.5 to 2 inches (4 cm to 5 cm) in length. Their skin has a lumpy texture to it, giving them a warty appearance. They are virtually indistinguishable from the Cope’s Gray Tree Frog, Hyla chrysoscelis, the only readily noticeable difference being their calls. Cope’s Gray Tree Frog has a shorter, faster call . The Gray Tree Frog also has an extra set of chromosomes (4N), or 48 in total, and is called Tetraploid Gray Treefrog in scientific circles. The more southerly Cope’s Gray Treefrog, or Diploid Gray Treefrog, retained its 2N (24) original chromosome set, so there is speculation of successful hybridization in the past. Both Hyla chrysoscelis and Hyla versicolor have bright yellow patches on the hind legs, which distinguishes them from other tree frogs, such as Hyla avivoca (Martof et al. 1980). The bright patches are normally only visible while the frog is jumping. Both species of Gray tree frogs are slightly sexually dimorphic. Males have black or gray throats, while the throat of the female is lighter (Tyning 1990). Tadpoles have a rounded body (as opposed to the more elongated bodies of stream species) with a high, wide tail that can be colored red if predators are in the system. Metamorphosis can occur in as little as 2 months with optimal conditions. At metamorphosis, the new froglets will almost always turn green for a day or two before changing to the more common gray. Young frogs will also sometimes maintain a light green color and turn gray or darker green after reaching adulthood. Gray Tree Frogs inhabit a wide range, and can be found in most of the eastern half of the United States, as far west as central Texas. They also range into Canada in the provinces of Ontario and Manitoba, with an isolated population in New Brunswick. Wild caught gray treefrogs are frequently found in the pet trade. They make excellent, undemanding captives. A moderately humid vivarium of live plants is generally quite adequate to house them, along with a varied diet of commercially available crickets, small moths, caterpillars, mealworms, flies, spiders, other insects, and occasionally other small mammals. Be sure to provide a source of water for your tree frog or mist frequently to keep the skin moist. If skin is dry it could die off. These pets are common in and around the Arkansas, Oklahoma, and Missouri region. grey tree frogs are so cute and so sos so sos os sos cool! 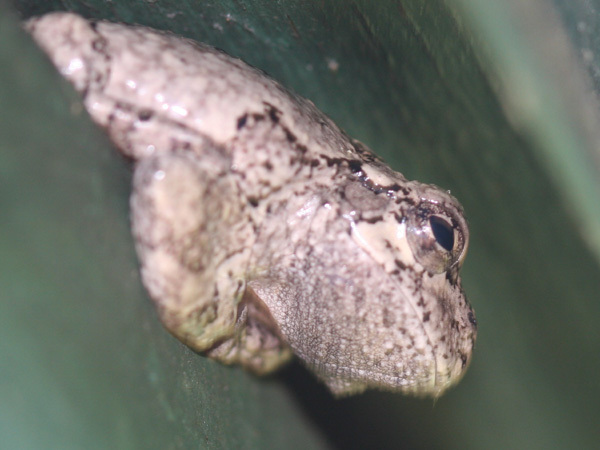 I spotted a gray tree frog on my pool gate today, june 3, 2010, at about 5:30. At first I didn’t bealive that there was a frog on my gate and that it was a tree frog in NY, I could tell by its fingers. It only moved when I would open and close the gate. Eventually, it made it to the top and just stayed there for a while and looked like it was going to fall asleep. I think I was luky because as it was climbing I was able to see its yellow-orange coloring on the inside of its legs. This was veary interesting to me and I loved the sight of it. I have a pair of gray tree frogs that live in an area of high ornamental grass, right next to my house. At first, I saw just one sunning himself on a Milkweed Plant, but now he has attracted a mate with his occasional peeping. It’s looking as if the female is going to accept him, and I’m voyeuristically hoping to see them mate. They let me pour pure filtered water on their backs, so their skin stays nice and moist. But, mostly I try not to disturb them, (so they’ll MATE)… In a strange way, I find this whole episode kind of exciting. I recently made a frog pond in my backyard (live in southern coastal Virginia) for my daughter this spring. Word got out and one of my neighbors brought over some tadpoles he saw in a ditch near his house. Out of about 20 only one survived (or maybe the other ones just left? most of them were still visible when they had started growing front legs) but he/she seems to be doing well. It turned out to be a green frog. This past week I have heard calls coming from the pond (which I initially thought was the new green frog) but when I went out at night with a flashlight I saw the frog call coming from a tree above the pond. I luckily caught sight of it and it was a greyish looking frog sitting on a branch. I quickly did some online research and discovered by matching it’s call and picture as a Cope’s Tree Frog. Its been 3 days now and after a brief rain tonight he’s out calling again. I wonder if he’ll attract any mates? And if they do lay eggs in the frog pond I wonder if my green frog and the Cope tree frog will have territory issues. And I wonder if my pond (only about 4 feet diameter and <8 inches deep) is big enough for what most sites say could be a 2000 egg deposit. Will keep an update. So 3 days have passed and no gray frog eggs despite a couple of nights of tree frog calling. However, I now have at least 5 green frogs inhabiting the pond. I have a new resident in one of my birdhouses. I believe it’s a grey tree frog. He seems to sun himself in the morning and only his head and front legs hang out of the hole of the bird house. He doesn’t mind our taking an up-close look at him, but I’m not touching him! We live in central NH. I have a grey tree frog living in my terra cotta planter along with a hibiscus on my deck.I think he’s been there since it got really hot and humid here in NC.. The first day we had nice weather he left for a day. I guess he leaves in the evening for foraging and then returns and rests all day.. Isn’t this unusual? Okay so there was a oklahoma tree frog in my bathtub for almost a week before we went to the pet store and purchased a critter keeper for the lil guy. I caught ONE white frog in the bathtub and watched him for ONE week alone in his cage then last night I came home and the ONE tree frog has turned into TWO…any ideas on how this could have happened. We purchased everything new from the pet store and have not let the lil guy out of the keeper since we put him in. Found a tree frog just now living in my bathroom in Alabama. What do I do with it? I think you should take it outdoors or else buy some habitat for it. I had one living in my hibiscus planter outside. He hung out during the day and came out at nite to look for food.. Right now he’s missing. He has been living there since May. I wish he’d return.. I’m no expert, just an amateur. Good Luck. Where do the frogs hibernate at its getting colder and i have two attached to our siding? I think they hiberate in tree (crevices) They will go when they’re ready.. Mine left about a week ago and I live in Charlotte, NC. Every day I check my planter so he knew when it was time to leave. I just discovered a grey tree frog in my wren house. He is sticking his head out and seems to be sunning happily. I couldnt believe it. I hope a wren doesnt decide to make a home there now. What a cute little creature. I have enjoyed reading about them. This is the wettest year in Minnesota in years. I am sure that has something to do with it. Wonders never cease. you can’t even have a converation if the door is open at times but love them! I read they can live up to 15 yrs! as the floating decorative ducks making froggie love! I’ve raised a bunch of tadpoles w/ special tadpole food, etc. and I think they’re hanging around :). They’re all very used to me looking at them and don’t seem fazed. I had one living in my planter last year in the summer and then he left in October.. I found one this year on my wood deck railing and proceeded to relocate it to another safe planter.. Apparently, he or she did not like to new accommodations and left, (so I thought).. Not sure if it’s the same one, but I found him in a crevice on the deck (between the window frame and the house) and there he stays. I have lots of different types of small frogs here in NC, but don’t hear much from them until the evening.. There’s a frogfest going on here. They don’t bother going into the pool, unless they fall in.. I’ve rescued quite a few from the pool and the skimmer. They also hang around by my garage at night, where it’s well lit. any idea what Jamaican tree frogs do during the day time? or why they don’t talk in the day? We’ve had several grey tree frogs living in our deck box during the warm weather months for the past few years. One large and two smaller ones this year. We live in NE Pennsylvania. The box is warped so there is a slight opening for them to get out at night and then they return during the day. I think the box keeps them cool and protects them from other predators. I thought these frogs needed to live near a body of water, no? We do not have a pond or pool. I got tired of finding their droppings and tried to relocate them to a woodpile at the back of my yard but they kept returning to the box so I gave up. I guess they are growing on me. Question: Did the same tree frogs return to the deck box? My property is less than an acre. I think they are the same ones but nobody believes me. I live in a NW suburb of Chicago close to the Wisconsin border. I found A Grey tree frog parked on the rim of my backyard outdoor hot tub under the cover. I scooped him up and let him go in my front yard landscaped area. A day later he appeared back on the hot tub. Day or two later I discovered 2 on the rim of the hot tub. Lately I just find one, they do not seem to swim in the spa (I think). Must be just hanging out at the rim of it for the humidity. At first when I would go in my hot tub he would slowly leave the area, Now they don’t seem to be phased by my presence. We have 4 dogs and they don’t seem phased by them either. I was afraid my dogs would eat them but one day my American Bulldog spotted him on the hot tub, she was curious but did not bother it. It’s been a Hot, Hot summer here in Chicago with very little rain, perhaps that is why they like my Spa? They really seem to like our too, we have found them in the basement twice now as well. My daughter found one first and then a month or so later I discovered him in the basement again. Not to sure how they are getting in, each time we just let them outside. Thanks for the info on them. Cool little creatures, don’t mind them at all. Hope they return next summer. I have a tree frog living in a wren house again this year, it kicked out the wren that was living I it . I need to put up another house for the wren! What is an Empidonax Flycatcher? Where Are You Birding This First Weekend of July 2008? West to Montezuma: Cranes, Coots and More!